The economy continues on a stable path, along with relatively low levels of inflation. In this cycle, tighter Fed policy involves not only raising short-term rates, but also reducing the size of the Fed’s balance sheet. The magnitude of growth of the Fed’s balance sheet in recent years was unprecedented. Its reduction is also unprecedented. We expect the Fed to move gradually and telegraph its policy, allowing markets time to adjust without harmful disruptions. Our equity allocations are unchanged this quarter and remain entirely domestic. We utilize large caps for conservative portfolios, while including mid and small caps where risk tolerance is higher. Our bond allocations include short, intermediate and long maturities. We also believe speculative grade bonds are helpful in pursuing income objectives. Our growth/value style bias shifts from 30/70 to an even weight of 50/50. The economy remains on a stable trend so far in 2017. Unemployment remains low, while consumer and business sentiment are improving. Accordingly, the Fed has continued on its path of gradually raising short-term interest rates. At this point, it appears the pace of tightening is appropriate, and isn’t tipping the economy toward a recession. Still, we’re keeping a close eye on monetary policy, because there’s a unique issue the Fed is managing in this cycle: the reduction of its own balance sheet. What exactly is the Fed’s balance sheet? Without getting into too many details, the Fed’s balance sheet reflects the value of assets it has purchased in the financial markets, most of which are bonds. When the Fed buys assets, it pays for them by simply creating money. It’s sort of like a digital printing press that increases money supply. Conversely, when the Fed sells assets, the proceeds are taken out of the economy, lowering the supply of money. The Fed normally expands and shrinks its balance sheet by buying and selling short-maturity bonds, thereby directing short-term interest rates, according to its desired policy. However, during the financial crisis in 2008, the Fed altered the kinds of assets it would purchase in order to help stabilize the markets. Then, after stabilizing markets, the Fed began purchasing long-maturity Treasury and mortgage bonds (a policy called “Quantitative Easing,” or “QE” for short) in an attempt to stimulate the economy by driving long-term interest rates lower. 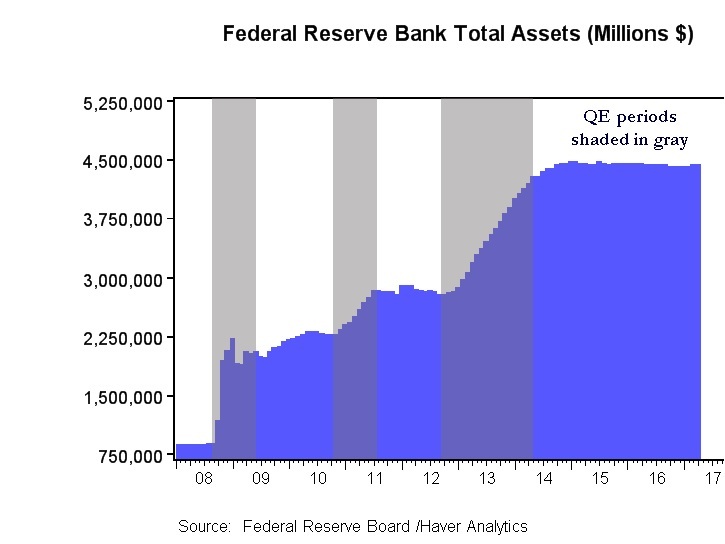 In this graph, we can see the total assets of the Fed. In 2008, its balance sheet had assets worth about $900 billion. Although this was a large number, it was a function of multi-decade growth, having risen along with the overall size of the economy. Through three rounds of QE, the Fed’s balance sheet growth accelerated rapidly, ultimately quintupling assets to almost $4.5 trillion. Unfortunately, the economic stimulus from QE didn’t materialize. Most of the increase in money supply remained parked as excess reserves in the banking system. Lending stalled as financial regulations made banks very cautious to lend, while at the same time most qualified borrowers were simply not interested in more debt. So, today, as the Fed guides short-term rates gradually higher, it is also contemplating how to lower the size of its balance sheet. If most of the increase in money supply is parked as excess reserves in the U.S. banking system, a gradual decline in the Fed’s balance sheet shouldn’t be too disruptive to the availability of credit and shouldn’t harm the economy…in theory. The problem is, nobody really knows how to shrink a balance sheet of this size. How much? How fast? When? It’s an unprecedented endeavor. Fortunately, the Fed has significant leeway in how it moves forward. It has already had success in telegraphing its interest rate policy, and we expect the Fed to communicate its balance sheet plan in a way that fosters gradual adjustments by financial markets, borrowers and lenders. It’s worth noting this leeway is derived from a stable economy. In the event the economy begins to falter, or is disrupted by geopolitical events, the Fed’s efforts will become much more complicated. It’s also worth mentioning that uncertainty regarding White House policies may also cloud the economic landscape. We have not yet ascertained whether the president will favor traditional supply-side economics, or if populist priorities will rule the day. Generally speaking, a supply-side bias would create more predictability for the Fed, whereas populist policies toward protectionism would tend to create more inflation, geopolitical risk and uncertainty for the Fed. Accordingly, we’ll be closely monitoring economic trends, geopolitical risk, White House policies and how the Fed decides to navigate the unprecedented reduction of its balance sheet. Even as the post-election euphoria leveled off, equities were still able to begin 2017 on a positive trend, with large caps delivering some of the best returns. We believe the environment for equities should remain generally good, although we are a bit more cautious given that valuations have risen over the past few years. Our work indicates there has been a close relationship between increases in the Fed’s balance sheet and equity valuations (stock P/E ratios rose during periods of QE), so we are monitoring equities to see if a shrinking balance sheet has the opposite effect. Our early work indicates that a gradual decline in the Fed’s balance sheet may not be overly disruptive to equities. We maintain our focus on domestic equities, with no foreign developed or emerging equity exposure. We continue to believe the return/risk profile is more favorable for U.S. equities against the backdrop of potential earnings, valuations, currency risk and geopolitical uncertainty. We utilize large caps for more conservative models, while including more exposure to mid and small caps where risk tolerance is higher. Within large caps, we are overweight financials, industrials and utilities, while being underweight telecom and consumer staples. We are adjusting our style bias from 30/70 growth/value to an evenly balanced 50/50, based upon our views toward sectors and industries within each style. After rising in the latter half of 2016, Treasury yields were generally stable in the first quarter of 2017. Seemingly, as the optimism for higher growth mellowed, so too did concerns for future inflation and more aggressive tightening by the Fed. Our expectation is for both growth and inflation to remain generally in line with current levels, with the potential to rise modestly over the next few quarters. A wildcard here may be trade policy. If protectionist policies were to actually manifest, they would likely drive inflation higher. We are also watching to see how the decline in the Fed’s balance sheet affects bond yields. Against this backdrop, we feel it is appropriate for most bond investors to include a variety of maturities, sectors and credit qualities in their bond allocations. These include short, intermediate and long-maturities, including Treasury, corporate and MBS. We also include speculative grade bonds, where the default rates appear relatively benign. It is worth mentioning that we continue to see important diversification benefits from longer maturity bonds as this asset class has a tendency to rise when equities decline, helping to address overall portfolio risk. Fundamentals in real estate are generally good, although we prefer to limit or avoid exposure to retailing, where certain markets may face ongoing challenges. Broadly speaking, real estate capital costs and financing should remain relatively low, while occupancy and rental rates are likely to be constructive. We also expect foreign capital to continue flowing into U.S. real estate. We remain out of commodities where the return/risk does not appear as favorable. China continues to be the marginal source of demand for most commodities, and we have concerns regarding the stability of the country’s growth rate. In addition, we expect energy commodities to have a negative bias given significant global supply capacity.